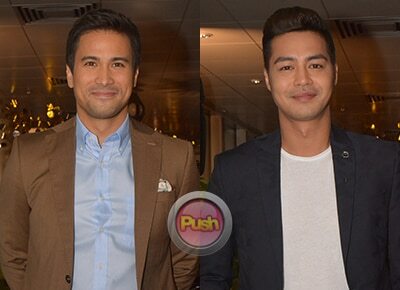 As part of Star Cinema’s newest romantic comedy offering The Third Party, Sam Milby and Zanjoe Marudo play a gay couple who cross paths once again with Sam’s ex-gifrlend played by Angel Locsin. The two heartthrobs admitted it was a different kind of experience for both of them. "Hindi ko naman ito first time gumanap bilang isang gay pero first time kong gumanap na nasa relationship so bago sa akin ito. Kasi dati tatay ako, dun lang ako gumawa ng isang gay role,” Zanjoe shared during The Third Party presscon held last September 29 inside the ABS-CBN compound. Sam said playing his first gay role was a big challenge. "Para sa akin excited ako kasi first time na gagawin ko yung ganitong role. It’s something different para sa akin. It’s nice to be able to work again with Zanjoe and Angel. Actually yung first two projects nila sa ABS-CBN kasama ako dun. First movie ni Zanjoe You Got Me kasama ako dun. Tapos yung (kay Angel) first MMK (niya) at saka Only You na teleserye,” he shared. In the film, the two actors both play doctors whose lives get more complicated when Sam’s ex-girlfriend moves in with them. Zanjoe said he did not have anyone in mind when portraying his role. "Actually wala. Kaya ang sarap niyang gawin eh. Normal lang na gagawin. Dini-direct kami ni direk tapos sasabihin niya sa amin kung ano lang kailangan. Pag pinanuod mo mukha naman akong bading (laughs). Yung unang gay role ko medyo slapstick eh. Ito internal yung atake,” he said. During their first shooting day, the Third Party stars admitted they both felt awkward before the cameras started rolling. "Awkward nung simula kasi first time naming gagawin ito eh. Pero hindi pa ginagawa na-a-awkward kami pero once na ginawa na namin siya, nagulat kami na parang enjoy naman pala. Yung trabaho namin hindi puwedeng kulang yun eh, hindi puwedeng hilaw. Mahahalata eh,” Zanjoe recalled. But at the end of the day, Sam said they started becoming more comfortable with their roles. "The first few scenes na parang sweet kami parang ang awkward pero na-enjoy namin. Pinagtawanan lang namin,” Sam added.